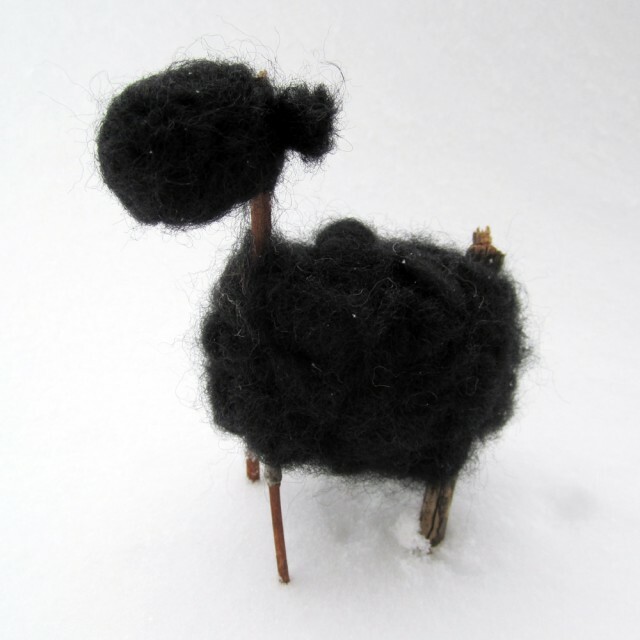 I canâ€™t wait until the day I have my own flock of sheep to dally around with, so I made one to keep me company while I wait! 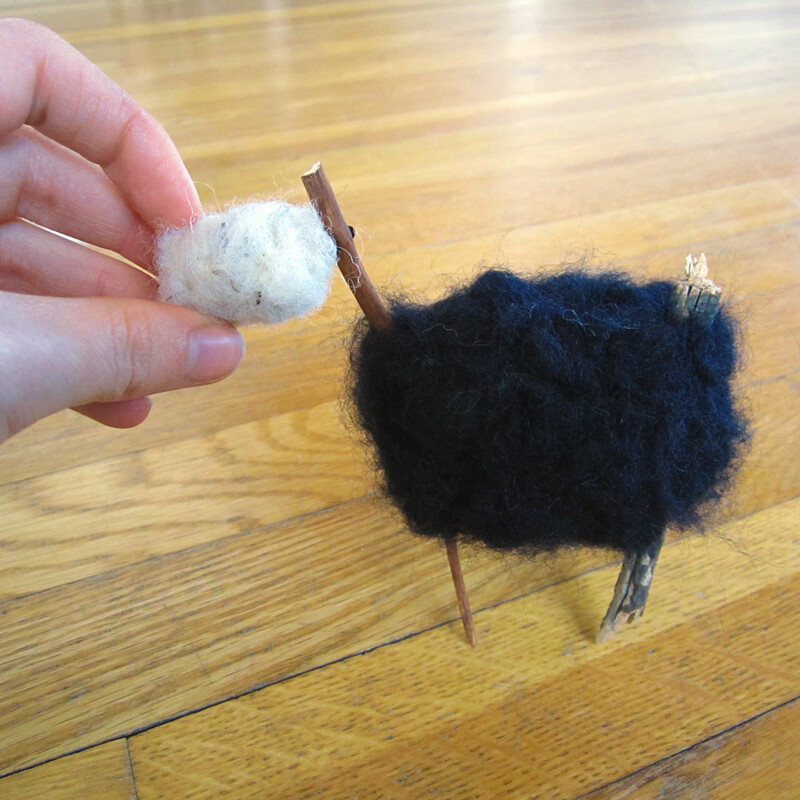 These little sheep use all natural materialsâ€¦ a few twigs you find on your morning walk, some scraps of wool from another project and a little bit of thread. While theyâ€™re a little fragile, these sheep look so cozy and happy on a shelf with some teacups or peacefully grazing past their stiffer, ceramic friends. 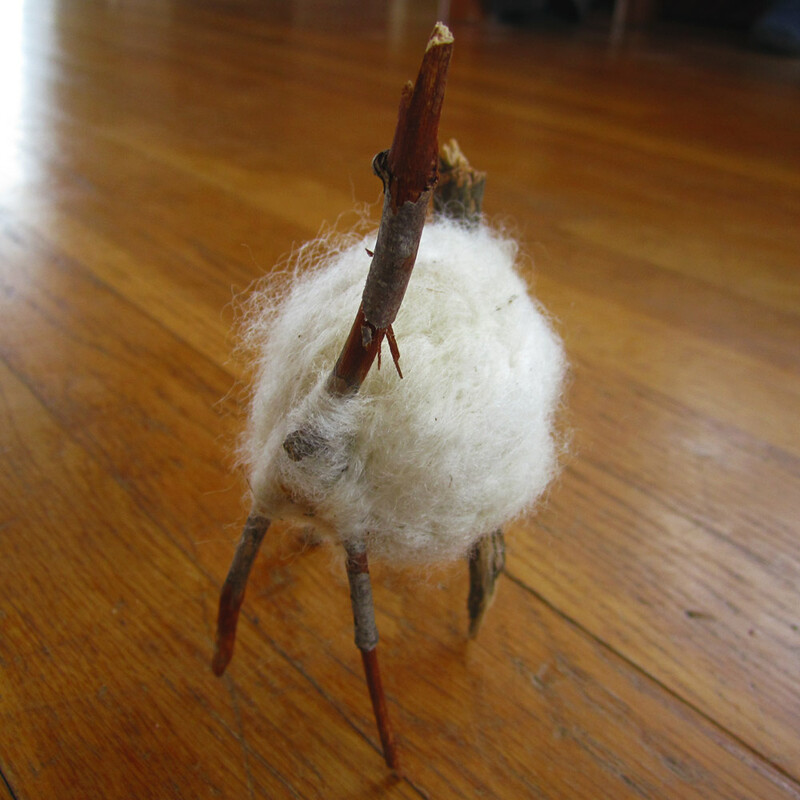 Your biggest challenge in this project is finding two perfect, small, forked branches to use as legs. I look for fairly straight and sturdy sticks. 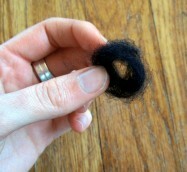 Make sure to keep them on the longer side of things, you can always trim them down to the right size when youâ€™re done. 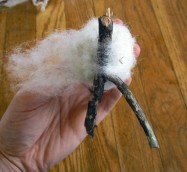 The twigs I used here were roughly four inches long from tip to tip. 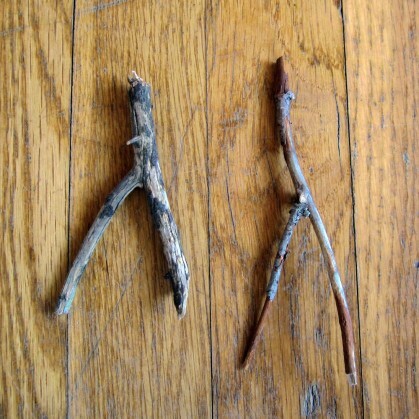 Make sure to leave the straight, stem portion of one of the twigs longer than the other. 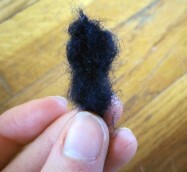 This will become the neck of your wee sheep. 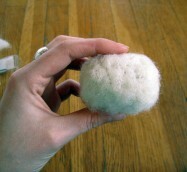 Next, take your wool and form an oval shape about the size of a large apple. 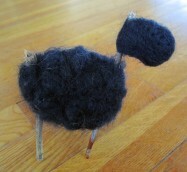 This will be the body of your sheep. 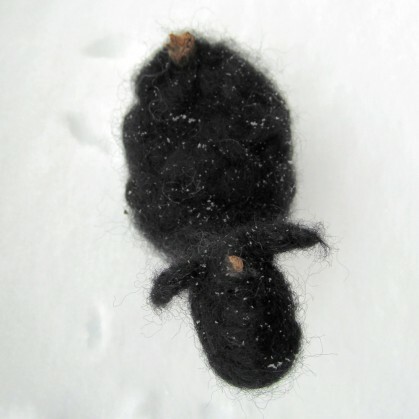 Take a few yards of thread and firmly wrap it around your ball of wool lengthwise until you have a hot dog shape. 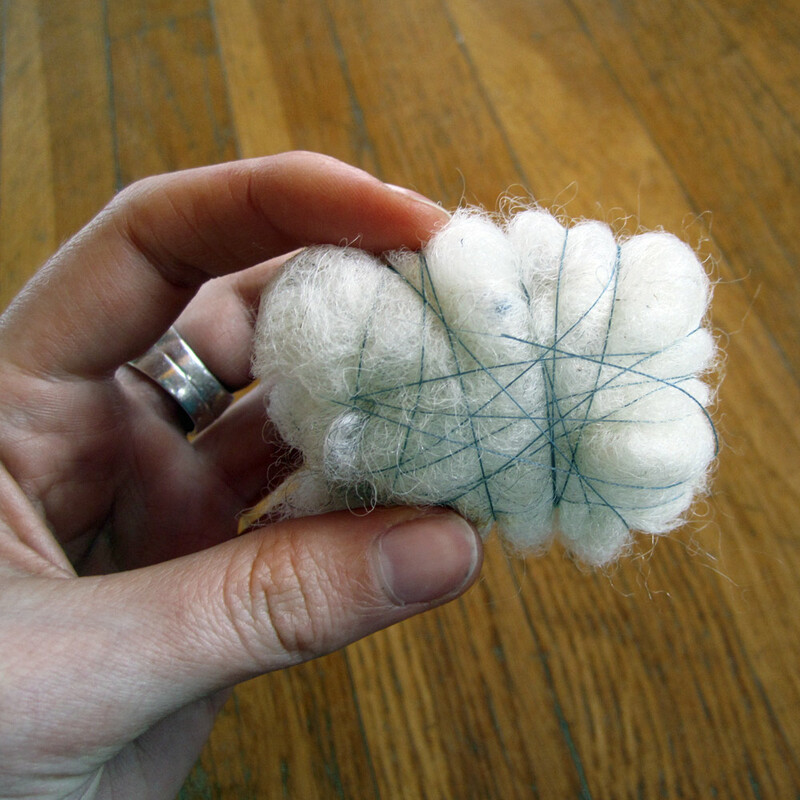 Next, fold the â€œhot dogâ€ into thirds like a letter and then wrap the thread around to secure the ends. 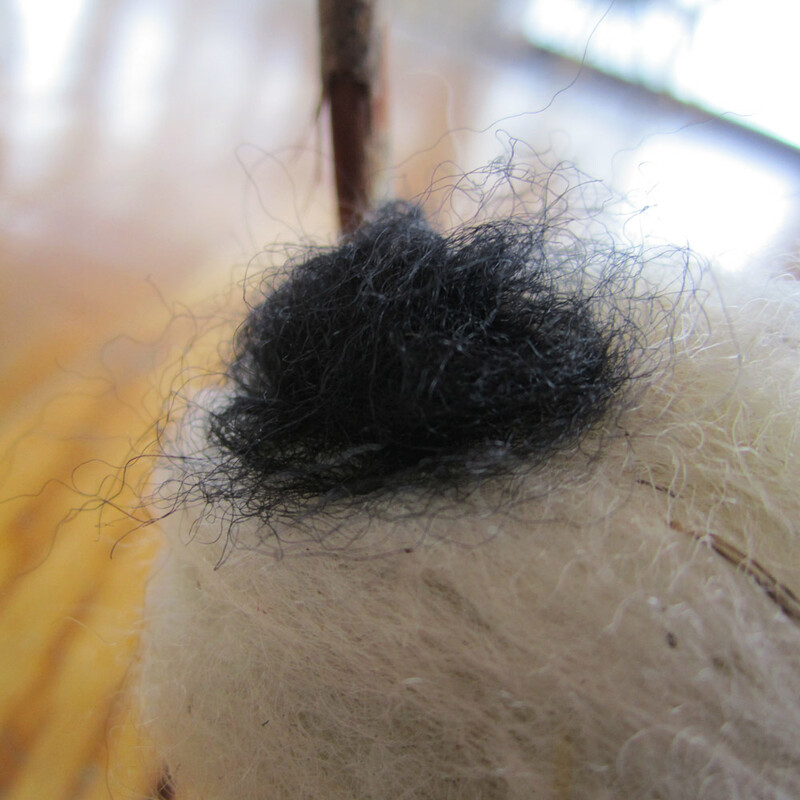 Make sure you wrap everything firmly otherwise the thread will become loose when you start to needle felt. 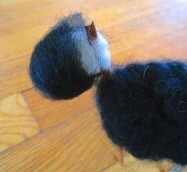 Briefly needle felt the body so that it is firm but still bouncy when you give it a squeeze with your hand. Wrap the body with three or so layers of wool. 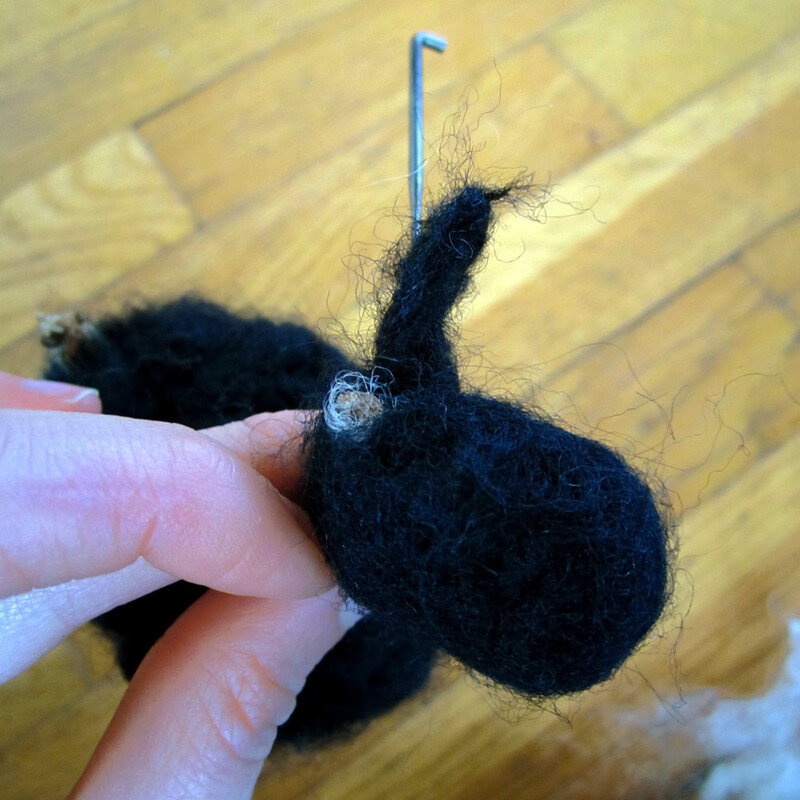 Make sure the coverage is even, no thread shows through and that you alternate the direction you wrap the wool in each layer. For example the first layer wraps lengthwise, the next wraps width wise and the third wraps lengthwise again. 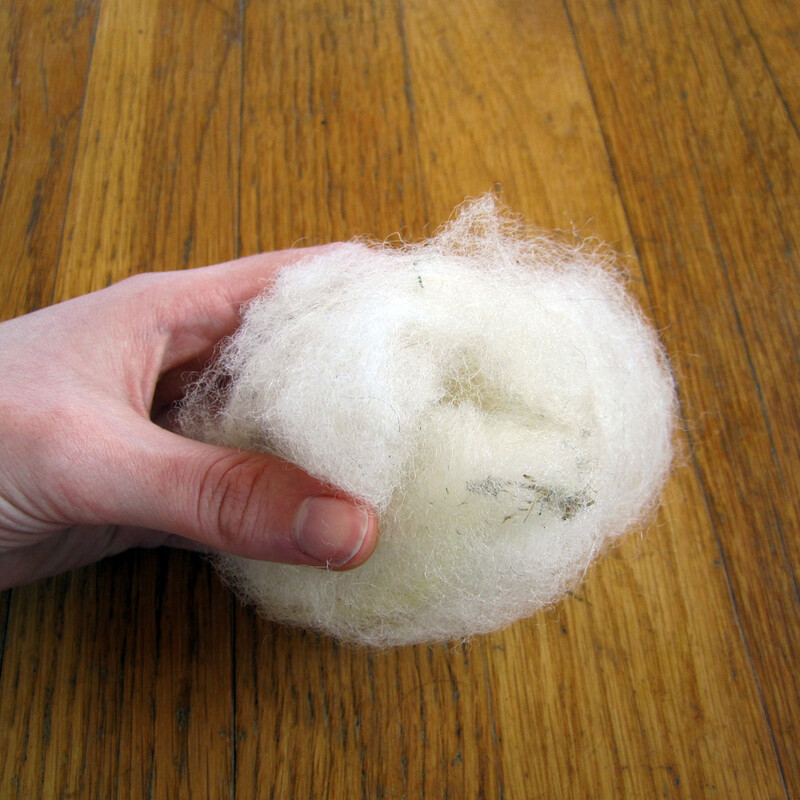 Needle felt the new layers of wool so that they provide a firm surface. 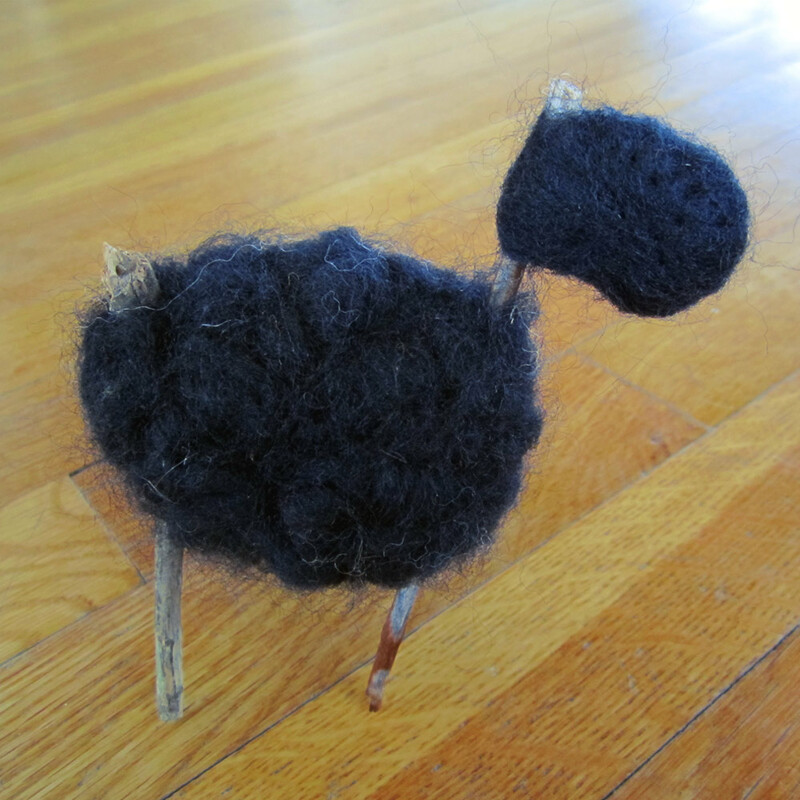 Now we need to attach the legs! 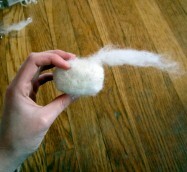 Take a length of roving and tack one end of it to the hip area of the sheep body. 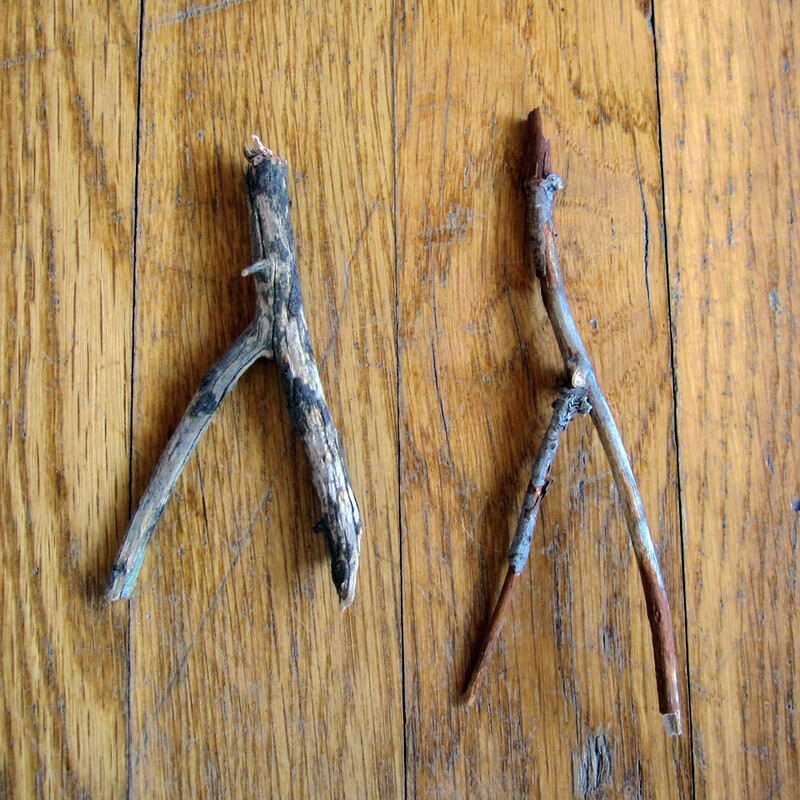 Hold the main branch of one of the twigs against the haunch area, pull the piece of roving across the twig and tack it to the other hip. 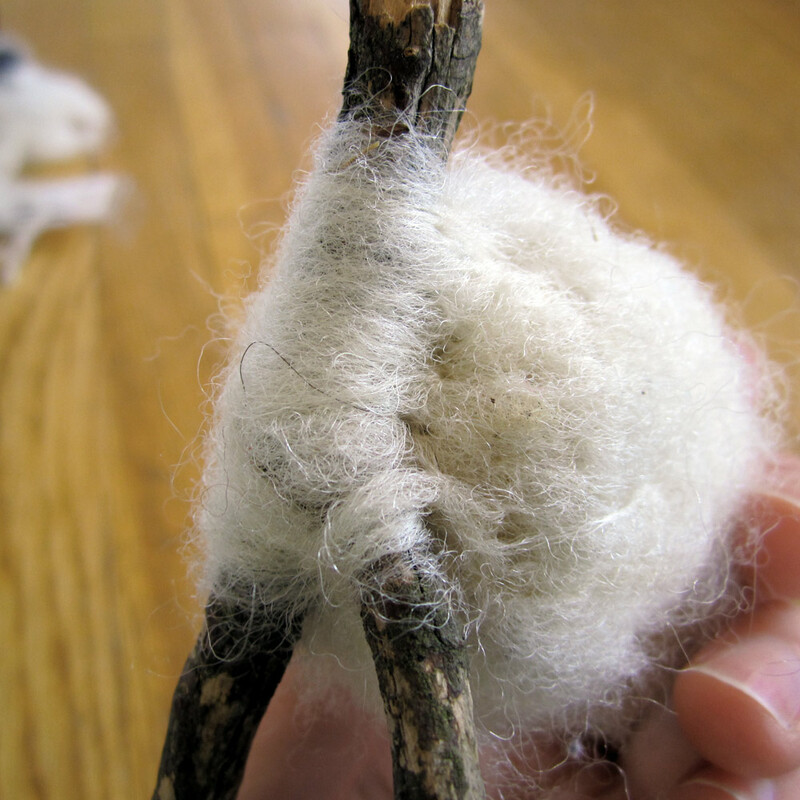 Use your needle to tack the wool down along the edges of the stick. 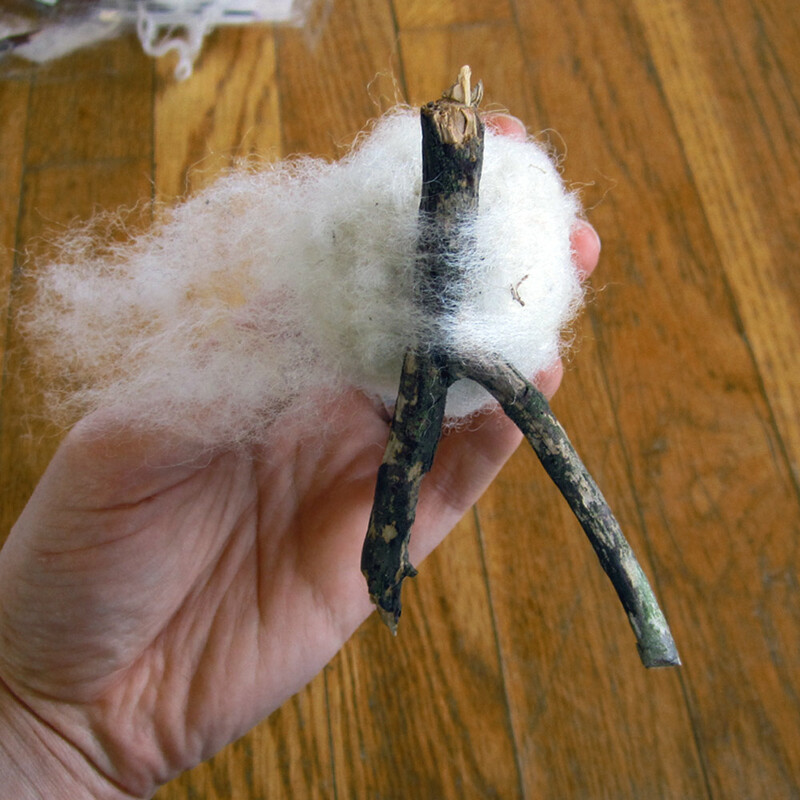 Continue to add strips of roving across the stick, alternating between stretching the roving directly across the haunches and angling it downward between the forked portion of the twig. The goal is to anchor the legs firmly in place. Make sure you felt the loose ends of the roving down across the body of your sheep after each pass over the stick. In the end, you shouldnâ€™t be able to wiggle the legs at all. Repeat for the front legs. Now we get to add the wooly coat! 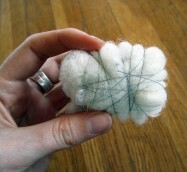 Take a small strip of roving and circle it around the tip of your finger. Take it off your finger and hold it to the body of your sheep. Gently anchor it to the body with three or four stabs of your needle around the edges and one or two through the middle of the shape. 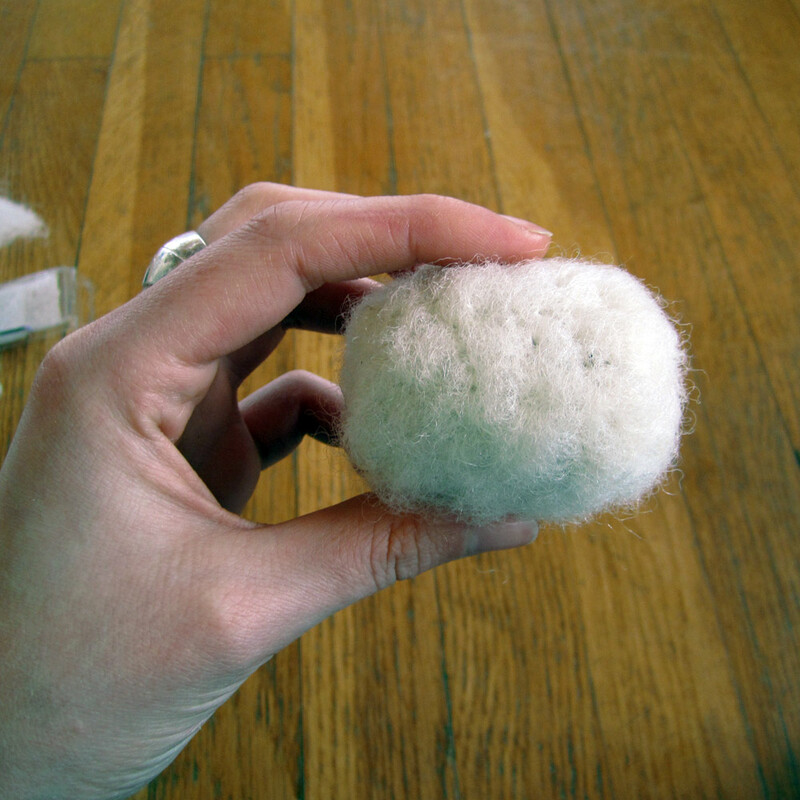 You want to create a small bubble of wool that is well anchored but still puffy. 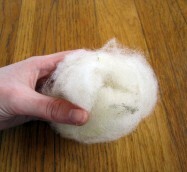 Continue to cover the body with pillows of wool, making sure to completely cover the underlying form. Now comes the head! 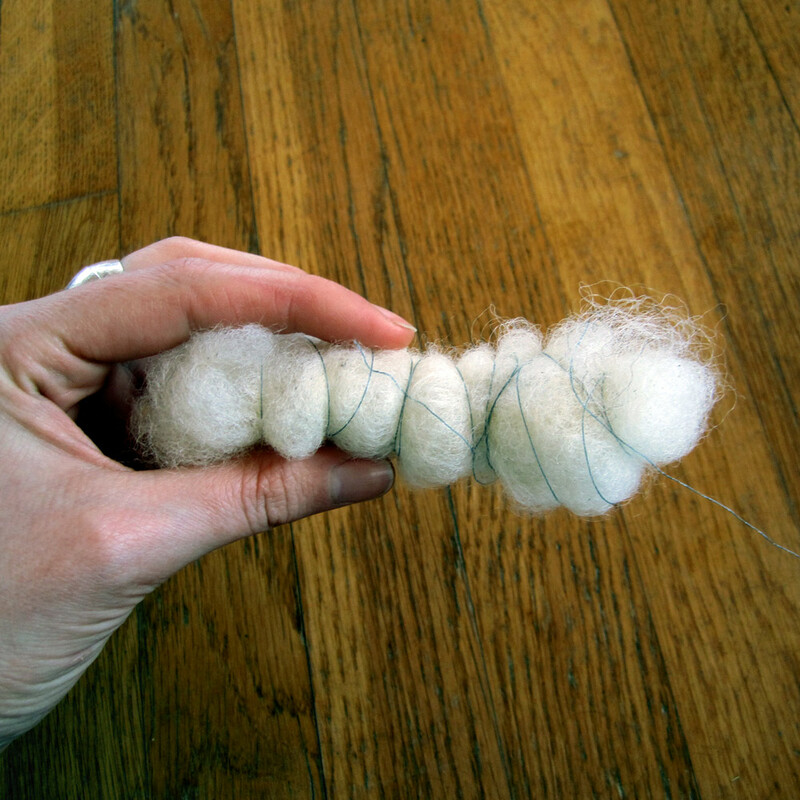 Make a thumb-sized roll of roving. 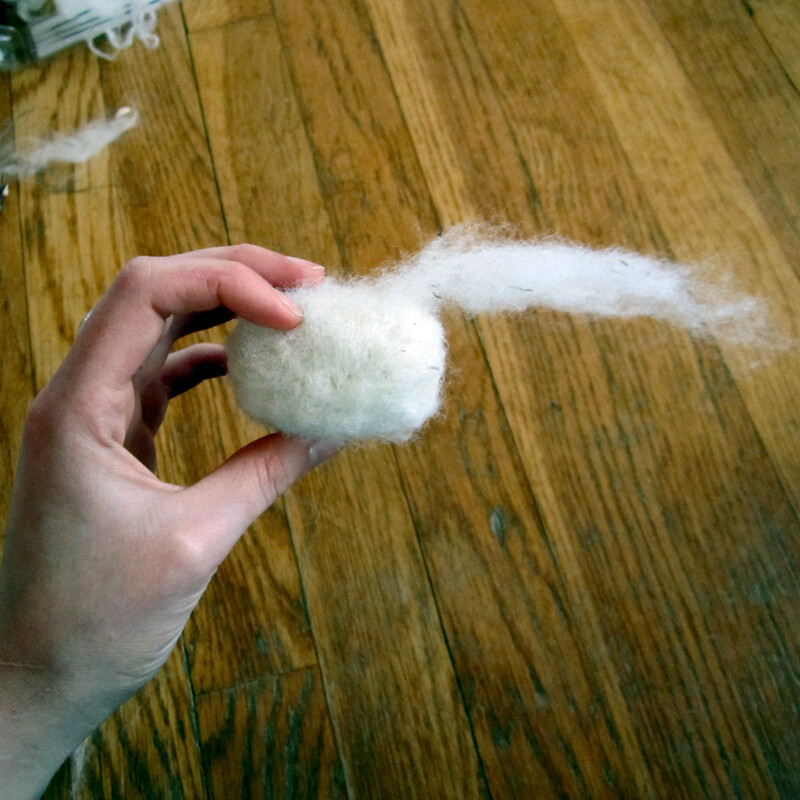 Firmly needle felt the slug of roving so that it is a solid mass (this is where a foam mat comes in handy). When itâ€™s the size and shape you want follow the same steps you took to attach the body to the legs. Next you need to coat the base form with the body color. 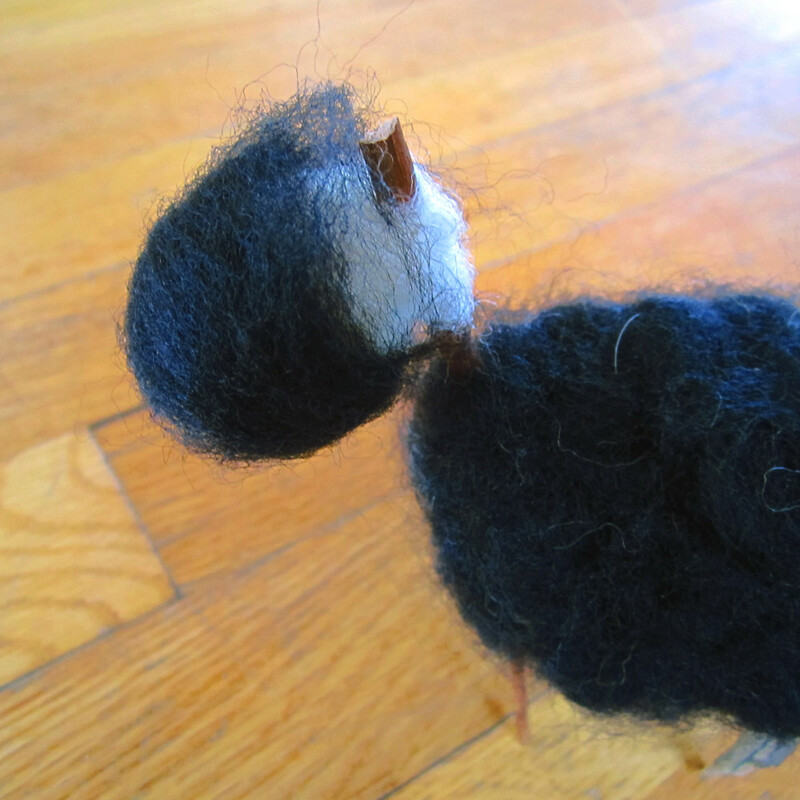 Gently wrap some layers of roving around the muzzle and the back of the headâ€¦ like to you did with the body form, and firmly needle felt everything down making sure that everything is coveredâ€¦ especially around the woody neck. The last wooly step is attaching the ears. 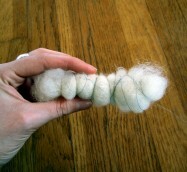 Take a small strip of roving and twist it between our fingers a few times to make a loose yarn. 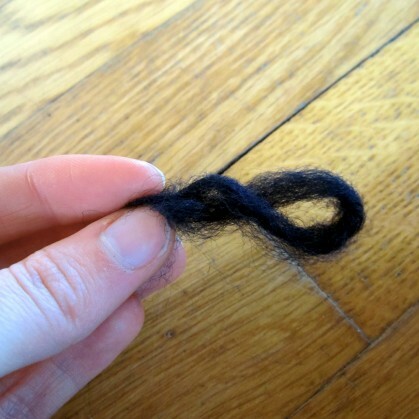 Hold the two ends together to form a loop and let the yarn twist on itself. 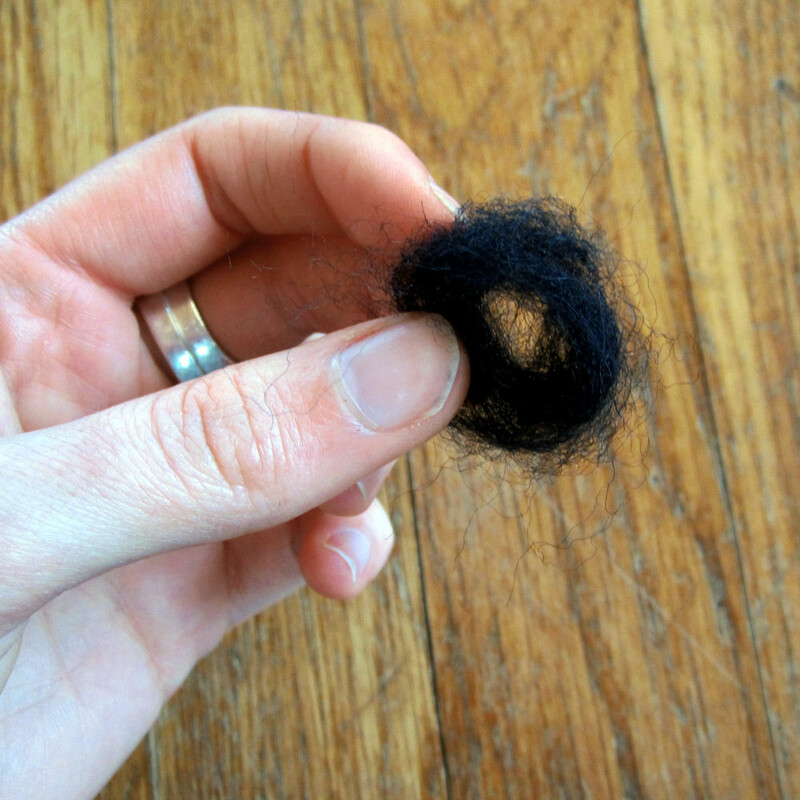 Grab the folded end and give loop another full twist. Grasp the loose ends and the folded end together forming a double thick loop. Needle felt the folded end into a solid oval shape. 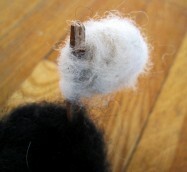 This will be the tip of your sheep’s ear. 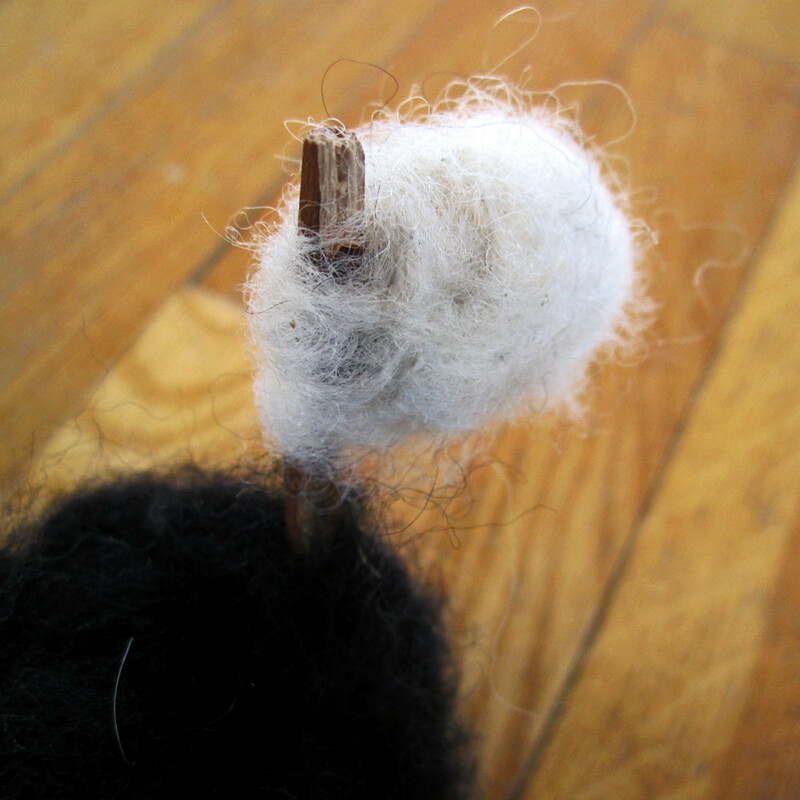 Use our needle to punch the loose ends of the ear deep into the head next to the stick. 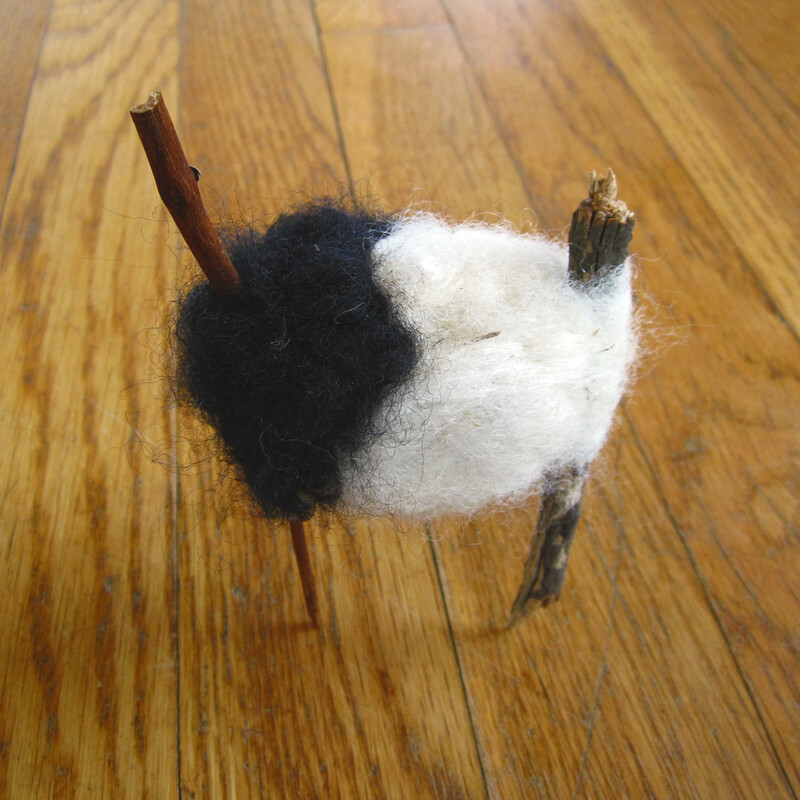 Repeat with the other side.The very last step is to trim the hooves down so that your sheep is balanced and isn’t teetering all over the place. Also this is a good time to snip off any extra stick coming out of the top of the head and rumpus. I've found that needle felting on a small piece of foam padding really helps me avoid accidentally pricking myself with those terribly sharp needles. Especially when it comes to working on the head.